The Minnesota Society of Costumers was proud to present our Chapter Award “The Hotdish” at Costume Con 29, held in Hasborough Heights, NJ. The Award usually consists of a small Pyrex bowl and a gift certificate for tator tots from Sonic, on a stick. However, this year we were unable to transport these items and instead all recipients of the award received a can of Spam® Lite, in honor of Austin, MN. 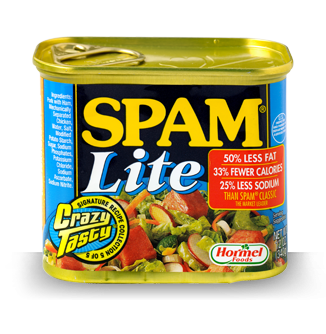 As such, it has become known as the “Spammy” award. In the future we are going to stick with this plan, and award a can of Spam® (on a stick!) to all future recipients of our chapter award. The award was well received this year (at one point the entire audience started to chant “Spam, spam, spam, spam…”) and MNSOC received a hearty round of applause as the newest chapter of the ICG (International Costumer’s Guild). The first award went to the “Showboat” entry in the Sci-Fi/Fantasy Masquerade. The second award went to the “Bill and Ted’s Excellent Adventure” entry in the Historical Masquerade. We had a great time giving out the award, and look forward to giving out this fun award to many deserving individuals in the future! Kudos for representing MN so well. Wish I could have been there. Definitely love the ‘Spam’ award. Looking forward to attending in Denver in 2013.